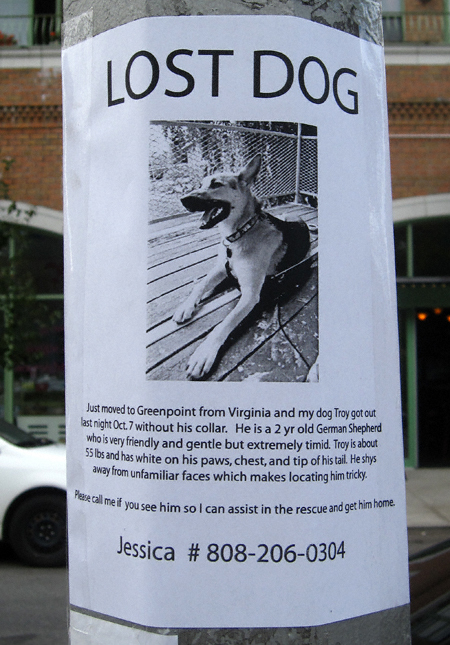 Just moved to Greenpoint from Virginia and my dog Troy got out last night Oct. 7 without his collar. He is a 2 yr old German Shepherd who is very friendly and gentle but extremely timid. Troy is about 55 lbs and has white on his paws, chest, and tip of his tail. He shys away from unfamiliar faces which makes locating him tricky. Please call me if you see him so I can assist in the rescue and get him home. If you have seen Troy or know of his whereabouts you know what to do… Thanks! 2 Comments on Has Anyone Seen Troy? Troy has been returned to his home! I was walking home last night and noticed my upstairs neighbor, who doesn’t own a dog, was walking one. Fast forward 10 minutes later, I’m checking your blog (as I have been doing daily for years) and see this posting about Troy. I thought he looked familiar and told my wife about it. This morning my wife saw our neighbor and sure enough, he was found a couple of days ago. We referred back to your blog, they called the owner and we hear that Troy was brought home today. So thank you for posting this and for making this wonderful blog. WOW!!! This is great news!!! Thanks for sharing this with me!! !